Canadian Master Bombardier Clint Godsoe, Kandahar Provincial Reconstruction Team (PRT) patrols Kandahar August 26, 2008 on the way to deliver donated school supplies to a local school. The Kandahar PRT has worked on many construction projects such as schools and government facilities to assist the Afghan government improve the lives of residents (ISAF Photo by Staff Sgt. Jeffrey Duran). The Battle of Panjwaii was fought in mid-2006 between primarily Canadian and Afghan soldiers, supported by small elements of Dutch, American, and British forces, and the Taliban. There were two separate times in which the forces were involved in heavy fighting in the region. The first phase was fought in July 2006, and the second encounter lasted from September to October 2006. Prior to the summer upsurge of violence and fighting, there were limited contacts in the Panjwai district. 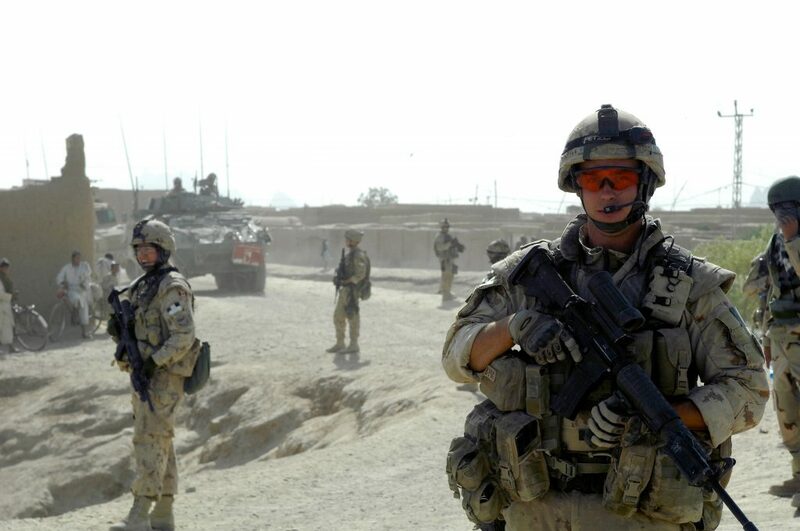 On May 17 there were a number of battles between Canadian soldiers and Taliban fighters. One of the contacts claimed the life of Captain Nichola Goddard, Canada’s first female combat arms casualty. The Battle of Panjwaii cost Canada 16 dead soldiers and more than 40 wounded. The US lost 1 Navy Seal and the UK lost 14 men when a Chinook helicopter carrying troops was shot down by the Taliban. Estimates place Taliban losses at almost 2000. A further 400 Taliban prisoners were taken. Civilian casualties were surprisingly light for an operation of such size. Estimates place total civilian casualties around the 20 mark, both dead and wounded. The Battle of Panjwaii achieved its desired effect. The Taliban were pushed out of the region and attacks on Canadian and other NATO partners ceased. The battle also had an unintended effect that would change the course of the war. It taught the Taliban that they could not hope to stand up to coalition forces in a head-to-head battle. NATO troops were simply better trained, better equipped and better led than the Taliban. 2006 saw the Taliban shift from head-on clashes to classical guerrilla warfare, depending on stealth, ambushes, suprise and booby traps instead. Leading Seaman H.H. Nicolle, a victim of the Knights of Columbus Hostel fire, in the Royal Canadian Navy (R.C.N.) Hospital, St., John's, Newfoundland, 27 December 1942.